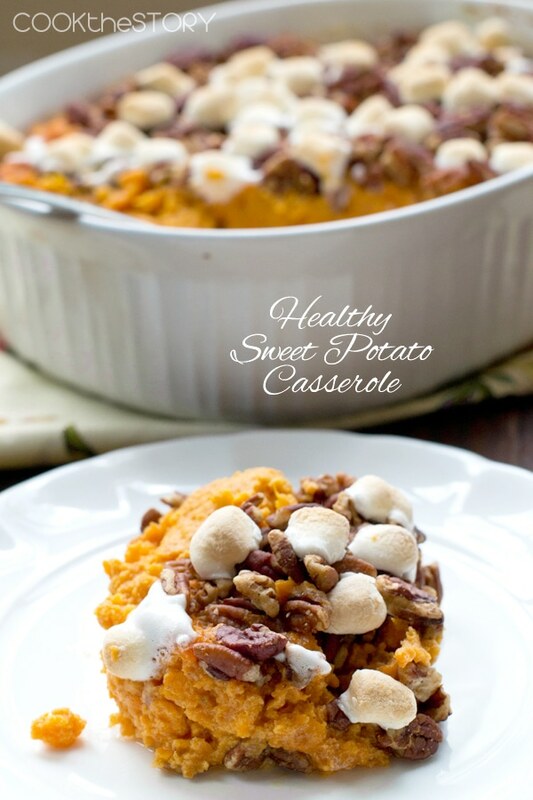 This Healthy Sweet Potato Casserole Recipe gets its sweetness and creaminess from low-fat vanilla yogurt instead of butter, cream and sugar. When I finally tasted sweet potato casserole, I didn’t love it. I found it too sweet and kind of strange. That was a few years ago. These days I’m totally on board with it. 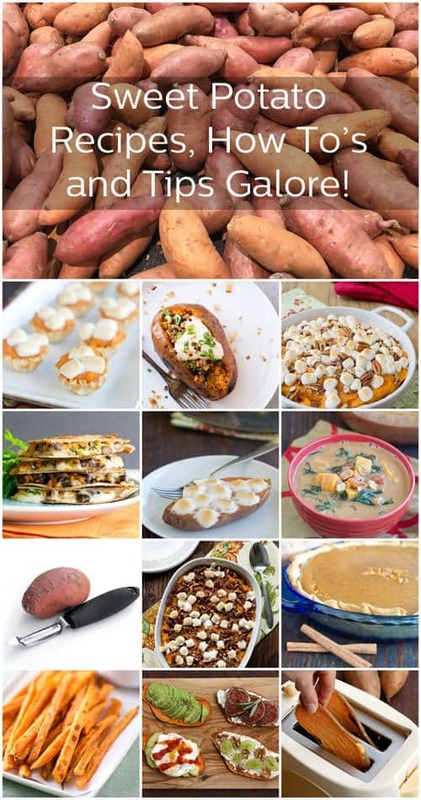 So much so that my sister site is doing a whole series on sweet potatoes right now and featuring a lot of sweet potato casserole recipes. Head over here to check it out. My favorite recipe there is for these adorable little sweet potato casserole bites. They’re the top left picture in the collage below. Soooo tasty. The goal for today’s recipe was to find a sweet potato casserole that both I and traditionalists will enjoy. This recipe is a touch less sweet than the classic. But you can add some extra brown sugar if you really need to. Check out the recipe below. It tells you when to taste it and when and how much sugar to add if you like it sweeter than I do. 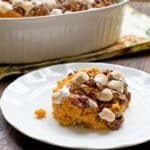 This recipe also addresses my other concern about Sweet Potato Casserole: Even though I like it now, I’m never sure I want to have very much because I know that it’s loaded with butter and cream and MARSHMALLOWS! I’d much prefer to save my calories for the stuffing and gravy – oh, and the pumpkin pie of course! I’ve played around with the basic recipe a bit to come up with something that’s just as creamy as the original but a bit healthier. This version doesn’t have any butter or cream. Instead, the creaminess comes from vanilla yogurt. To further reduce the sugar in the recipe, I’ve tweaked the classic sweet potato casserole topping by cutting back on the marshmallows. The marshmallows are still there and their brown puffiness will please traditionalists. But they don’t cover the whole casserole in melted candy. As for the Sweet Potato Casserole Topping: I have a trick for making sure that the marshmallows don’t get crunchy. 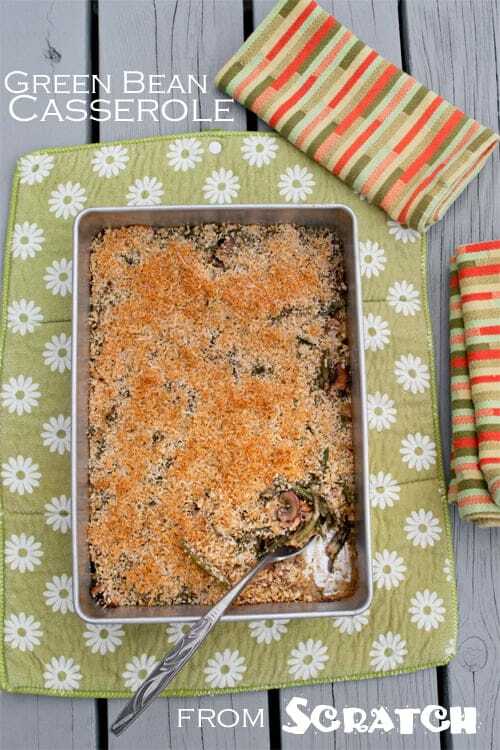 First, you bake the casserole for awhile without the topping. 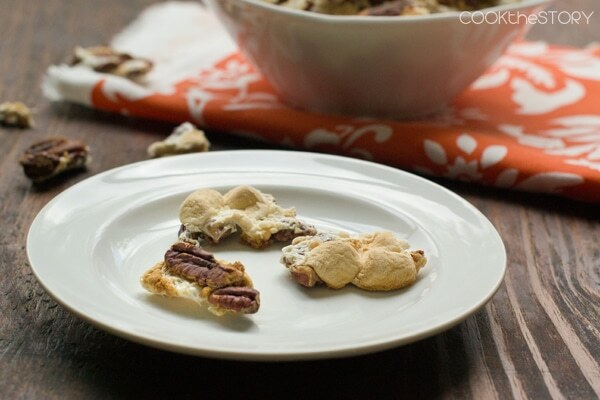 Then you add the pecans and marshmallows and continue to bake just until the marshmallows are puffed softly and starting to brown. This ensures that the pecans don’t get overly dark and bitter as well. 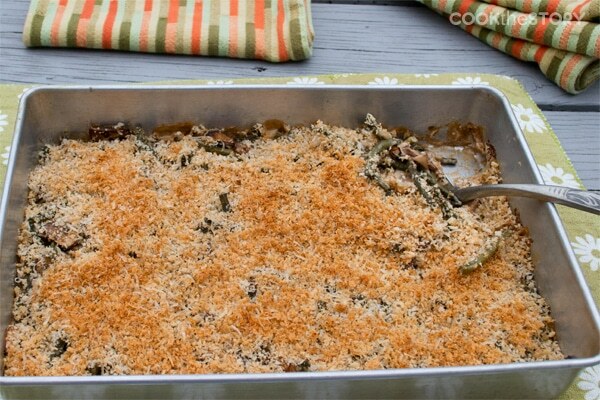 If you’re looking for more healthy Thanksgiving side dishes, be sure to also check out my recipe for Green Bean Casserole from Scratch. It’s just as tasty and just as easy as the original but with fresher ingredients. And now, here’s my Healthy Sweet Potato Casserole recipe. This healthier twist on the classic Sweet Potato Casserole uses low-fat vanilla yogurt instead of butter and cream. And there are fewer marshmallows on top. Gobble it up and don't feel any guilt about the Pumpkin Pie that's waiting for you after dinner! Preheat oven to 350F. Lightly grease or spray a 2.5 quart casserole dish. Put the sweet potatoes in a medium sauce pan with enough water ust to cover them. Bring to a boil over high heat. Reduce to as simmer and cook until fork-tender, 5-7 minutes. Drain them. Return the sweet potatoes to the pot and use an egg beater to mash them up (or transfer them to the bowl of a stand mixer and beat them in there. Add the yogurt, cinnamon, nutmeg and salt. Beat some more. Taste it. If it's not sweet enough for you, beat in brown sugar 1 tablespoon at a time and taste. Once you're satisfied with the sweetness, add the eggs and beat them in as well. Transfer the mixture to the lightly greased (or sprayed) casserole dish. Bake for 30 minutes. Top evenly with the pecans and marshmallows and continue to bake until marshmallows are puffed and lightly browned, 10-15 more minutes. This post originally appeared in November 2014 and was revised and republished in November 2016. What are the calories in a serving ?? I would really love to make this! 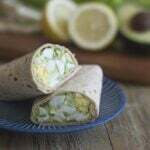 Do you have the macros on this recipe? Can you cook in morning and then reheat later in the day? Or can you prepare in the morning and just hold off and cook later on the day? Jamie, Both ways will work. This looks great! Is the yogurt regular or Greek yogurt? Thanks! Meissa, regular yogurt but Greek would work too. Thank you! 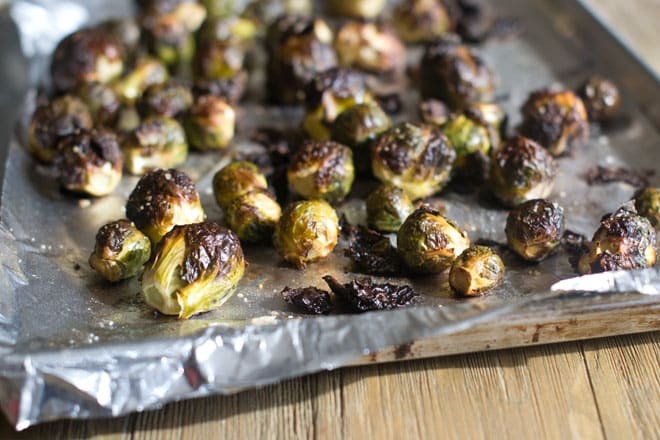 Do you have the nutritional value of this dish? This recipe sounds scrumptious! 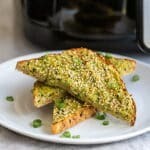 Can it be made in a crockpot? 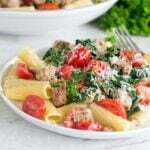 I’m looking for a recipe that can be frozen. I’m guessing this could be frozen if I don’t put the topping on it. 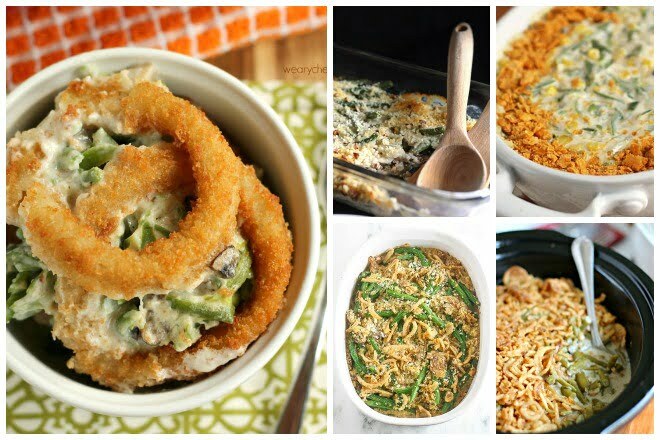 If I defrost casserole & add topping just before cooking, would that work? Michelle, Yes, I think this could be frozen no problem. My only concern would be that the sweet potato mixture could get a touch watery from freezing. You might want to freeze it in a ziptop bag, defrost it and then drain off any liquid before putting it in the casserole. And yes, I’d freeze it without the pecans and marshmallows. Just add those on the day you plan to cook it. Great question! Thank you for bringing something healthy to the table! !